Administrators of an Access ID can comment on individual media providers, which are displayed in the Channel’s overview for all associated media buyers. The "Global comment" is displayed next to a channel name. "Global note" can be used for more detailed price structures or for explanations of the contract or workflow. This information will be visible when a media buyer moves the mouse over the name of the respective provider. In addition, each user has the option to create personal notes in the same place. Usage notes allow my-picturemaxx users to communicate their intended use of each downloaded media file. You can now configure your company's usage notes, so your users can select from predefined templates when downloading and provide the usage details that are relevant to your company. 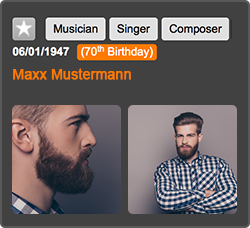 If your my-picturemaxx users include a usage note when downloading, it’s then easy to review your company’s download history and to associate downloads with their corresponding projects or buyers. 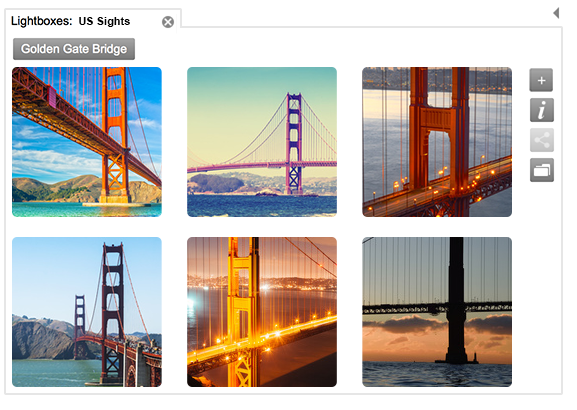 You can now drag and drop images from a lightbox or search results into an unopened lightbox in your "Projects" sidebar. Your lightbox scroll position is also now stored, so when you switch to a different lightbox, the lightbox opens where you last left it. You can drag and drop individual panels — such as Lightboxes, the supplier "Channels" list, and the Media Filter — inside or outside the main window. It's also possible to connect several docked elements together. As a result, individual views can be arranged even more clearly and structured. Lose a panel? Use the "View" menu to display hidden panels, or to select a new background color for my-picturemaxx. A new type of login allows you to work from any computer. Your my-picturemaxx settings, lightboxes, etc., are stored in the cloud and are always up to date. 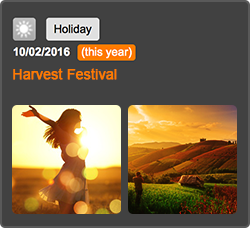 Discover our Media Filter and the 24-hour search button, or search directly by media number! A clever new foldout design makes all filters easy to access. Like the other moveable panels, you can drag the Media Filter anywhere you choose, and you can remove filters easily with a click of an orange cross. Want a more compact Media Filter? Simply go to the "View" menu and unselect it. Instead of being on the left-hand side, your search filters will then appear over search results. If you want to unhide the Media Filter panel, reselect it in the “View” menu. With just a click, search for media files created in the last 24 hours. Type in search terms first, or simply click the button to see all the latest. A new search index allows you to search for related keywords or phrases. You can further target your search by including quotes; for example, "John Fitzgerald Kennedy" or "Black Friday". You can choose to execute a new search, or search within your last results. Is your only reference a media number? No problem! It's now possible to search by media number. The "Advanced Search" provides Boolean and field-specific searches. Open it using the + icon next to the search field. You can pair it with media filters. The Advanced Search includes both "last searches" and "saved searches," so you can easily re-execute searches. 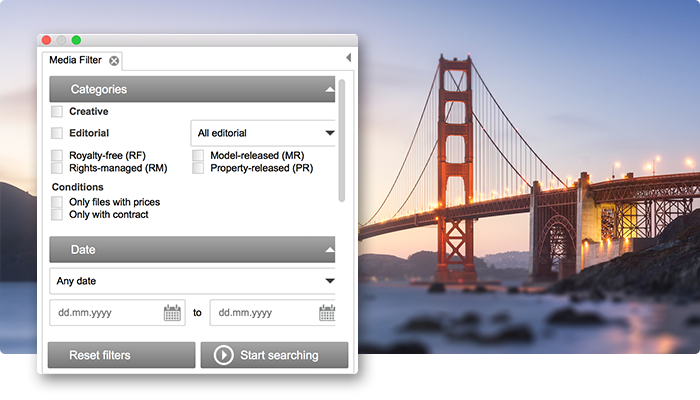 To save a search, simply enter a descriptive name in the "saved searches" field and click the disc icon. Have a specific question about a file? Just hover over its “i” icon. This standard thumbnail icon provides all relevant contact info, such as contact people, phone numbers and e-mail addresses. Hover over any thumbnail in search results to open its preview. 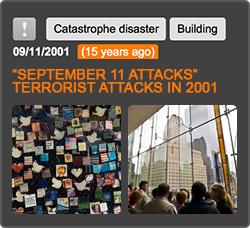 Each preview displays the image and its metadata. It also includes a series slider with clickable thumbnails of other files within the same series. Not seeing a mouseover? Go to the "Edit" menu and activate the mouseover features. 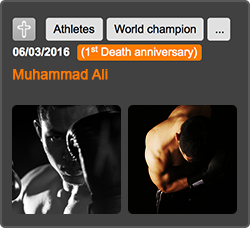 You can view search results as a gallery, list or mosaic. With new handy radio buttons, switching between views is even easier. In addition, you can sort results by date or supplier, or mix them. With the optimized 3-step zoom controller, you can even choose the size at which your results are presented. The "Channels" panel shows you a list of all suppliers included in your search and the number of hits from each. To just search a specific supplier's channel, type the supplier's name in the top field. Check out the new project folders and benefit from the new team features! You can create lightboxes from within a new lightbox management area. Here you can also create overarching project folders for organizing your lightboxes. All your lightboxes are presented in a beautiful list, which you can filter by project. 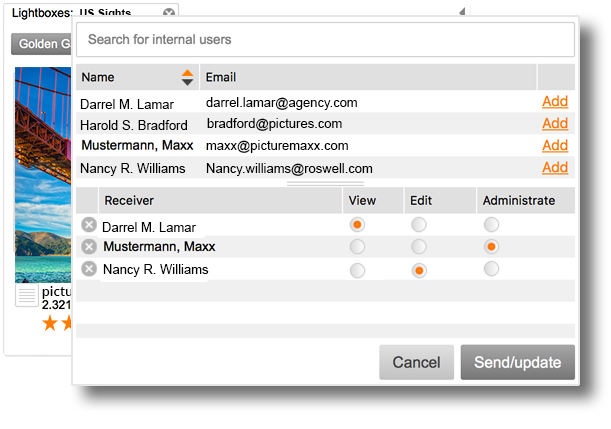 You can also set permissions to share lightboxes with other team members. A new search box helps you find lightboxes with lightning-fast speed. And, not only can you sort your lightboxes, you can also drag and drop them into a preferred order. You can access a new info panel from any lightbox via the "i" button. The panel displays the name of the lightbox's creator, the date the lightbox was created and last modified, its number of files, and any notes. 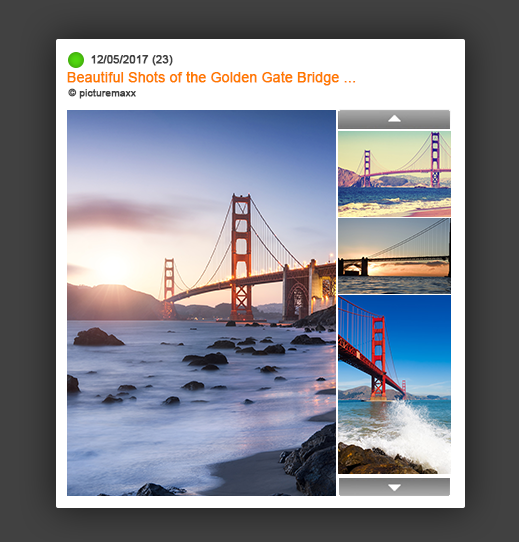 Use the new lightbox "note" field to add comments to any lightbox. Keep you and your colleagues up to date! 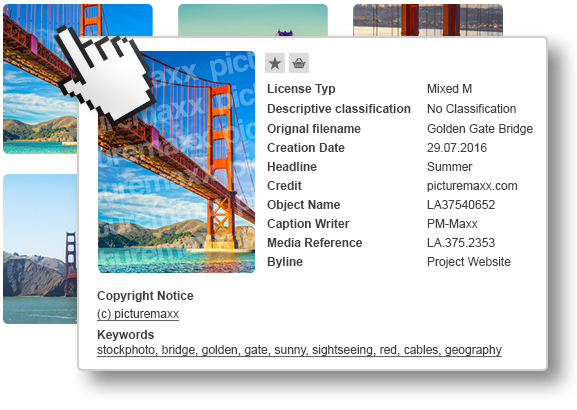 my-picturemaxx 5.0 allows you to share your lightboxes with other team members. 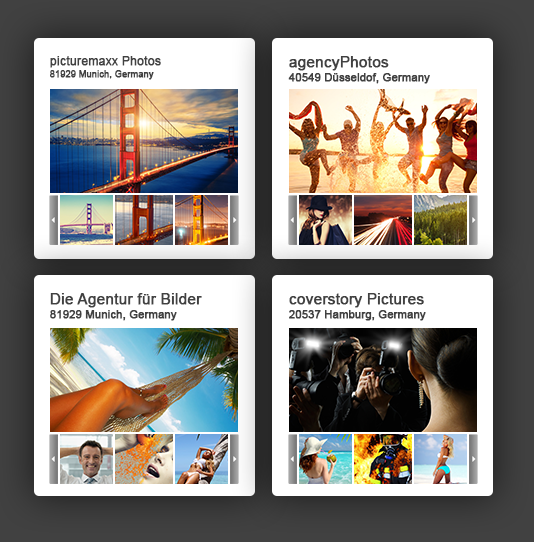 Clicking the share button automatically opens your address book, where all relevant my-picturemaxx users are saved. Just add recipients and send! 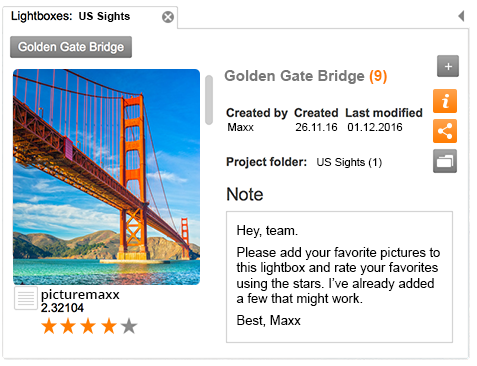 Using up to 5 stars, you can rank the media files in your lightbox, and you can even add your own individual notes to each file. Change the order of media in a lightbox per drag & drop. Our exclusive my-picturemaxx Services inspire you and provide you with readymade search results! Need inspiration for the next issue? 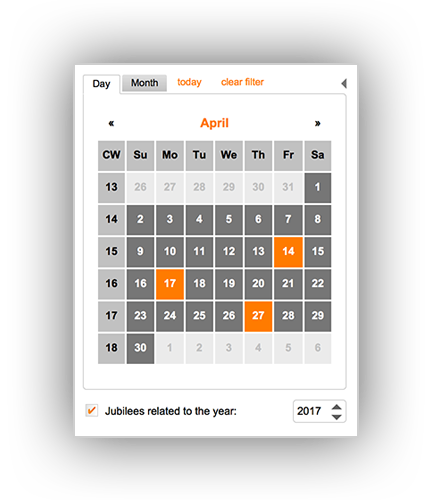 Have a look into the calendar service of my-picturemaxx and click on a date. my Calendar displays important national and international events. 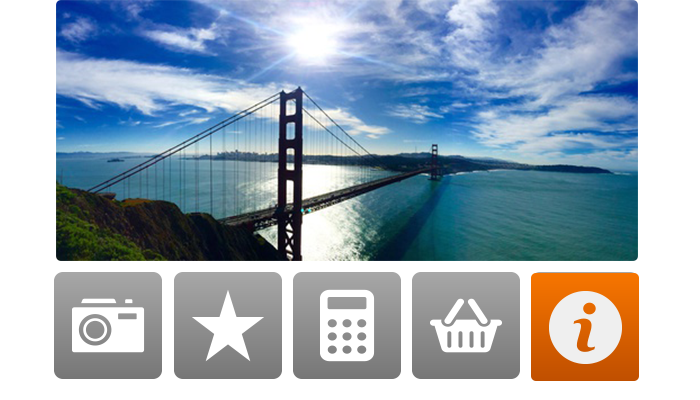 my-picturemaxx gets you a front-row seat at the world’s biggest events. See what the reporters see – from the hottest red-carpet images to videos of the latest goal. my Offers show search results especially compiled by the media providers with the most up-to-date media of the most important news or events in politics, sport, entertainment and many more. my-picturemaxx shows you exactly where you are shopping. Making contact is easy. Every supplier has a profile with address and contact information, as well as sample images and a company description. You can sort suppliers by subject, location and more! Feel like you're looking for a needle in a haystack? Can't think of the right keywords? With the my Requests service, you describe and send your specific research need. You can send a request to all media suppliers, or just specific ones. The suppliers can put together a selection for you, which you'll see directly in my-picturemaxx.